Lost in the Sun, 2016, acrylic on canvas over panel, 60x60"
"He had not died but he had faded out like a film in the sun." Traywick Contemporary is pleased to announce an exhibition of recent paintings and works on paper by Los Angeles artist Samantha Fields. This will be her second solo show with Traywick Contemporary. In her work, Fields explores the experiential nature of light—immersing the viewer in the ever-shifting mood of a specific time and place. Her paintings are documents of fleeting moments and ephemeral occurrences: smoke lingering in the sky from nearby fires, the blur of city lights reflected on wet pavement, the blazing sun in unprecedented heat waves, or transient shadows shifting across a nighttime landscape. 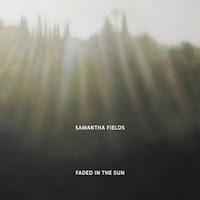 Fields' new series—Faded in the Sun—responds to growing environmental concerns that both trouble and fascinate her. The ubiquitous sun in the Western sky frames her focus on everyday ecological dramas that play out within a contemporary culture rife with conflict. Her paintings remind us that the sky is the ultimate equalizer, a shared experience that remains the same for everyone: a way to orient oneself in unfamiliar territory. 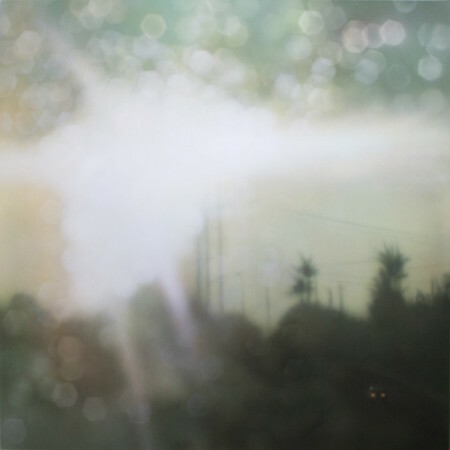 "Painting atmosphere with atmosphere," Fields uses an airbrush to apply hundreds of thinly misted layers of paint, creating rich, almost incandescent, surfaces. Her painting practice effectively removes the hand of the artist while also highlighting irregularities in both memory and photographic documentation by bringing into question the true nature of observed reality. Fields' compositions are veiled with sunspots, blurred with motion or obscured through layers of mist and fog. By focusing on representations of memory, enigmatic and unfixed, Fields captures the energy of fleeting moments with the dramatic beauty of fragile landscapes. Samantha Fields lives and works in Los Angeles. She has received numerous awards and recognition, including a prestigious City of Los Angeles (COLA) Individual Artist Grant. Her work has been collected by and exhibited at noted public institutions such as the Fine Arts Museums of San Francisco, CA; Crocker Art Museum, Sacramento, CA; Stanford University Health Care, Stanford, CA; the University Art Museum, CSU Long Beach, CA; Armory Center for the Arts, Pasadena, CA; Cranbrook Academy of Art Museum, Cranbrook, MI; Jones Center for Contemporary Art, Austin, TX; and the Irvine Fine Arts Center, Irvine, CA.